I want to preface this article with this statement: The 2-3 zone defense should not be allowed in youth basketball. Instead of listing the reasons why in this article, I encourage you to check out Tyler Coston’s article on the subject which has most of them covered in my opinion. The 2-3 zone is the most common zone used in the half-court. For better or worse, it’s used by teams of all ages at all levels. So it’s imperative that all coaches are prepared for when their team will face it. Since most youth teams don’t have the extra time to practice and memorize an entire zone offense, here are 17 strategies you can implement mid-game to help your team beat the 2-3 zone. 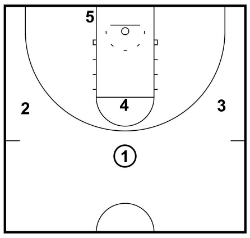 The 1-3-1 is the best formation to set up in offensively against a 2-3 zone. Traditionally, this will mean your point guard at the top, your shooting guard and small forward on the wings, one big on the free-throw line, and one big on the baseline. This formation is effective because it places your team in the gaps of the zone and forces the defense out of their ideal positions. When a player receives the basketball on the perimeter, there will often be a clear lane to the basket in front of them that they can attack. Being in the gaps of the defense can also confuse them as to who should guard the basketball which can lead to open players all over the floor. The easiest way to defeat a 2-3 zone is to avoid playing against it on as many possessions as possible. Your team can do this by utilizing quick transition basketball to beat the opposition team down the floor. If your players all run hard down the floor and the basketball is moved quickly, there will often be open lanes for your players to attack the basket before the defense is able to set up their zone. If a player receives the basketball and finds themselves with an open lane to the basket in front of them, they should immediately attack the gap. 1. The attacking player will split the defense and have a high-percentage shot at the rim. 2. The defense will collapse and take away the shot. The first option for the attacking player is to finish at the rim. Your players must always be aggressive and looking to score. If the defense collapses and takes away the drive, this will often mean there are open players on the perimeter for open shots or that when the basketball is pitched out there will be more open gaps in the defense. 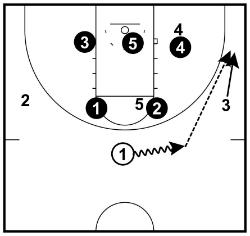 A great drill for teaching this action is the ‘Drive and Kick Drill’. Players will find that, with good spacing, the quicker the basketball is passed around the more gaps will present themselves in the defense. Pass fakes are super effective against a zone because the defense is always anticipating the next move they need to make. Often a single defender will have the difficult task of guarding two offensive players in their area. When a pass fake is made, the defender will usually anticipate where they need to rotate to next and start leaning towards their next assignment. This slight movement can lead to open lanes and the defenders taking valuable time to get back into the correct position. Make sure your players have been taught how to correctly fake a pass without coming off-balance so that they can explode to the ring if the defense goes for it. One of the weakest areas of a zone is the free-throw line. When the ball is at this position, the player with the basketball has many options to attack the defense. Nearly every time I watch a team play against a zone they put their center at the free-throw line in this position without even considering other options. It’s a mistake to automatically assume your center is the best option for this role. The most effective player to position in the middle of the zone is often the team’s best player and/or passer… regardless of their height. This player must be a threat to score and should also be one of your team’s best passers. Get them the basketball at the free throw line and let them create! The worst thing you can do against a zone is hold the basketball and allow the defense to fully recover and establish their ideal positions. In order to beat a zone, you must keep the defenders moving and scrambling to recover. This is achieved by quick passing of the basketball, good spacing between players, and constantly looking for gaps in the defense that can be exploited. Explain to your players that when they have possession they have a maximum of one second to decide whether to pass, shoot, or dribble. Keep in mind that the highest percentage shots you will get against a zone occur after one or two ball reversals when the defense is starting to break down and the defenders are fatigued. Another great strategy is to attack from behind the zone along the baseline. If you’re setting up in the 1-3-1, have the baseline player float between the short corners along the baseline depending on which side the basketball is on. Their feet should be nearly out of bounds in an effort to stay as low as possible. This either forces the defenders to play close to the baseline in order to watch the baseline player, or it allows baseline offensive player to hide behind the sight of the defense. 1. Pass to the offensive player at the free-throw line who will be open diving to the basket. 2. Shoot from the short corner. 3. 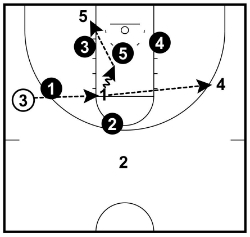 Pass to a perimeter player since the defense will collapse. 4. Shot fake and attack the rim for an easy basket or a foul. The player will also be a great scoring option after dribble penetration. When the low zone defenders step up to help on dribble penetration, a simple drop-down pass to the baseline player will often result in an easy score. One benefit of the opposing team running a zone is that the offense has the ability to decide the matchups on the court. When coaching against a 2-3 zone, identify the weak links and target these defenders by forcing them to match up against your best offensive players. For example: If the team your facing has one strong guard and one weak guard, you can send your best guard to the side of the floor that their weak guard is defending each time down the court. As this matchup favors the offense, your guard can blow past them every time and get into the paint where they can score or create a shot their teammates. This is also a great strategy when overloading. Overload towards what you consider to be the weaker side of the floor defensively. The best thing about screening a zone is that there’s no defender hedging or there to help on the dribbler when they use the screen. By screening the zone you’ll either get an open jump shot, or the defense will have to rotate to close out which will create open shots and driving lanes on other areas of the court. Either way, by setting screens on the zone it forces the defenders to help out of their zones. This will often lead to one of the guards getting in the lane where they can finish with a floater, dump down pass to the baseline, or pass out to a shooter when the defense collapses. I’ve included some plays that use screening in the report you can download for free below. A great way to consistently get high-percentage shots against a zone is to overload one side of the court. This strategy exploits the fact that in a zone defense each defender has a specific area of the court to guard. The offense should take advantage of this by placing three offensive players on one side of the court guarded by only two defenders. As long as the three players have spaced themselves out along the three-point line, the two defenders will struggle to challenge the shooters while also preventing dribble penetration. Another big weakness of the 2-3 zone is rebounding the basketball. The reason for this is because the players are defending zones and do not have a specific player matchup. Instead of being able to simply turn, make contact with their player and box out like in a man-to-man, players in a zone must first find an opposition player and establish rebounding position between them and the basket. This is a difficult task for the zone defenders so there are frequent offensive rebound opportunities (especially from the weak-side) as long as you send players to the glass and they’re relentless in pursuit of the ball. The biggest benefit of offensive rebounds is that they often lead to high-percentage shots. This is a controversial strategy… but one that definitely works if you’re willing to implement it. If your team gains an early lead in the game, consider holding the basketball near half-court so that the defense is forced to discard their 2-3 zone and come out and play you man-to-man. If they get back into a zone defense, get your point guard to retreat with the basketball back to near the half-court line until the opponent gets out of their zone. This strategy will only work if the league you’re playing in does not have a shot clock. Please note: Although effective, this strategy leads to boring, unwatchable basketball (Even ask Dean Smith of North Carolina who’s team held the basketball for nearly an entire half against Duke in 1979). A simple strategy that’s often forgotten. It’s a great idea to give your team some experience and confidence when competing against a 2-3 zone prior to coming up against it during a game. Assign a few 10-15 minute blocks in your practices early in the season to teach your players the strategies in this article that you think will work best for your team. Since your team will be competing against themselves, it’s not important that your players know how to run the 2-3 zone perfectly. Simply put the players in positions and explain to them that they must guard the area and not a specific player. Most of them will have a good idea of how it works. Your players will enjoy changing things up at practice and it will give them confidence when they face a 2-3 zone during a game. Fact: You are going to struggle against a 2-3 zone if you don’t make shots. It doesn’t matter how well you execute overloading the zone, how often the basketball into the hands of your best passer at the free throw line, or how good your spacing is if your players don’t knock down their shots. Your team must make perimeter shots if you’re going to defeat a 2-3 zone. This fact alone is the main reason why it’s such a common defense in youth basketball. If you want to develop great shooters, I highly recommend you check out these shooting drills and also these shooting workouts. I bet you’re asking… “Why does the particular defense we run matter? I just want to beat their 2-3 zone”. By using a full-court press, you change the tempo of the game. If you’re competing against a 2-3 zone, you should aim to increase the tempo of the game since a zone favors a slowed down type of game. By speeding the game up, the opposition will take quicker shots and there will be a lot more fast-break points where the opposition doesn’t have time to set up their zone. I’d recommend having a look at either the 2-2-1 press or the 1-2-1-1 diamond press. Don’t be the team that continues firing away from the outside if the shots aren’t going in. Weak-minded teams will settle for the outside shot without being patient and working the basketball around for a high-percentage look. You must get the basketball into the post. When the basketball is passed inside, it forces the defense to collapse and will result in wide-open jump shots for your team. If your team does start firing away at too many three-pointers and aren’t working the basketball around enough or getting it into the post, consider calling a time-out and telling the players the basketball must be passed into the post at least once before shooting. 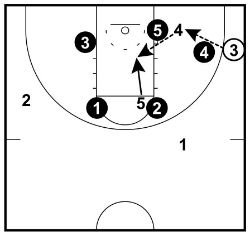 I never recommend running set plays for the entire game, but if you’re looking for a quick basket against a 2-3 zone, a set play or two might be exactly what you need. If you’re serious about being prepared, I encourage you to read my article on the 2-3 zone defense to completely understand its strengths and weaknesses. By understanding how it works, you’ll be taking giant step towards understanding how to exploit the 2-3 zone’s weaknesses. Don’t allow your team to fall into the trap of doing what the defense wants you to do. Which is settle for the outside shot and play a slow-tempo game. 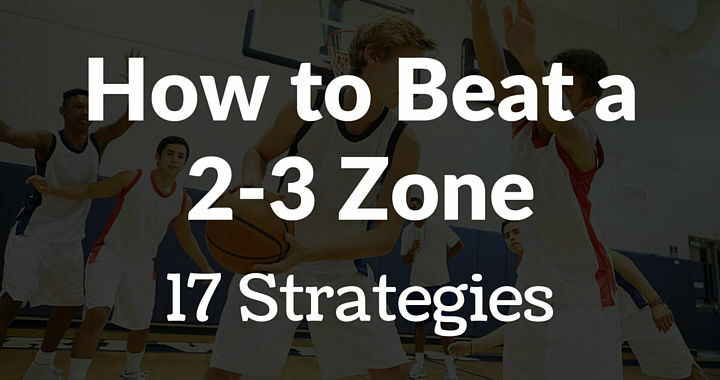 By using these strategies, you’ll have an arsenal of strategies to defeat the 2-3 zone when you face it during a game.